Are you a knitter? Are you a Crocheter or Weaver? Are you a keen lover of yarn/wool? 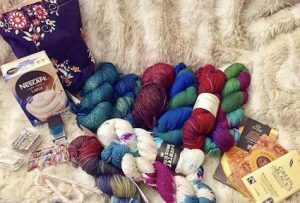 Are you addicted to all the lovely wool/yarn that is out on the market now? How about the chance to try some new wool that you have been drooling over for ages, well sign up to Woolswap now and you will be able to be matched with a fellow wool lover, who may just be able to fulfil your dream of obtaining that lovely wool. Do you have wool that you would like to swap? Do you have too much wool in your stash that you would like to send to a new home? Do you enjoy giving presents? Do you want to make some new yarny friends? If you answered yes to these questions then read on. Every few months we will be opening the registration process for becoming a Woolswapper. It will open on the 1st of the month, however, this may change from time to time and we will take registrations for 2 weeks only. Your details will then be collated and matched up with a fellow Woolswapper and within a week from the close off date, you will receive their details. You will then have one month to organise your items to send to your new friend. Please note that the minimum requirement that you must send is no less than 100 grams of wool, either purchased especially or it can be from your wool stash. But please remember to get in contact with your Woolswapper straight away to work out an agreed amount that you would like to swap. This way nobody will be disappointed. Remember to keep in mind the things that your wool swapper is interested in. Also pop in the extras, like needles, notebooks, teas and chocolates. Anything really this is left open only to your imagination. Please also feel free to take photos of your wool swapping experience and post on either Instagram and Facebook and remember to tag @woolswap and use the #woolswap so that we can then see and share back on our website and social media. Remember if you do join up you are committing to contacting your Woolswapper and sending them a parcel of yarny squishiness. You never know you may even make a friend for life in this fabulous yarny community. We are excited to update you on some changes ahead at Woolswap. We want to continue to grow and offer the service and results you’ve come to expect from us. In order to remain competitive while still maintaining our quality service, we have taken the step to now charge in US dollars. Stay tuned are there are some more even better exciting changes happening with Woolswap. That is all we can say for now, so watch this space. Describe why you feel that joining Woolswap was a success for you? I liked the fun of getting a present in the mail that I hadn't picked out, and I equally liked looking up my swap partner and working out what I thought she would like. My partner spent heaps of time picking perfect colours for me and I did for her. I liked that we could contact each other beforehand and we could set a price with each other so we didn't have to feel like we've disappointed by not doing enough or be disappointed! It was such a lot of fun to be part of and I'm so glad I signed up for 6 months. If a potential client was on the fence about whether to join Woolswap or not, what would you say to them? I'd say go for it! it is such a lot of fun and a great way of connecting with other people with similar interests. Being a knit designer, I have found Woolswap to be a great way to make new yarny friends from all over the world. You get exposed to new yarn dyers, get yummy treats and meet new people. Putting together yarny care packages is SO much fun. And getting fantastic packages in return is not so bad either!